The most popular times to visit Kyoto are during the Spring (March-May) and Fall (October-November) months when the weather is ideal and the landscape is at its most striking. Both seasons are characterized by a dramatic change in color – Spring for its cherry blossom pinks and whites, and Autumn for its fiery reds, oranges, and yellows. Unlike its cold winters and hot summers, the weather is mild in Spring and Fall so either season would be the perfect time to visit. If you’re interested in Kyoto’s festivals, then you can follow this link for a list of Kyoto’s annual festivals and events. It’ll give you a monthly breakdown of its weather as well. If you’re flying in to Japan, then chances are you’ll be arriving at Kansai International Airport (KIX). Located in Osaka, it’s the main access hub to the Kansai area. From KIX, you can take a train directly to Kyoto station. The trip takes less than 1.5 hrs and costs JPY 1,880 each way. You can check hyperdia.com for train schedules. Trains run from 6:30AM-10:16PM daily. If you’re traveling in a group or have a lot of luggage and would prefer to arrange for a private transfer, then you can do so through Klook or Kkday. Follow these links to book private airport transfers from KIX on Klook or Kkday. You’ll find other options for transfers on those pages as well. If you’re arriving at KIX late in the evening and don’t want to spend for a private transfer, then it’s best to stay the night in Osaka which is what we did. We took the Hankyu Railway train from Osaka to Kyoto the next morning for JPY 400 each, which I believe is one of the cheapest ways to travel between cities. The ride takes just 45 minutes each way. If you’re already in Japan, then you can take a train to Kyoto from wherever you are. You can check hyperdia.com for train routes and schedules. If you’re doing a multi-city tour of Japan, then you may be interested in purchasing a Japan Rail Pass. It will give you unlimited use of all JR national trains in Japan, including Shinkansen bullet trains and the Narita Express, for a consecutive number of days. Banks and post offices are the best places to exchange currency in Japan. Based on what I’ve read, people seem to prefer post offices because the transactions are faster. I exchanged currency at a bank and the process did take some time. I had to fill a bunch of paperwork then wait for the transaction to complete. But if you don’t mind the wait, then either place is fine. Alternatively, you can also withdraw JPY from an ATM. The rates are competitive. Just be sure to advise your bank you’ll be using your ATM card overseas so you don’t run into any problems. In my experience, my ATM card works in some machines but not in others. There is a LOT to see in Kyoto. With only 2 full days in the city, we had to rush through all these major attractions in just 48 hours. It wasn’t enough time to fully appreciate them, so I suggest spreading them out between 4 or 5 days if you can. As previously mentioned, Kyoto is NOT for rushing! 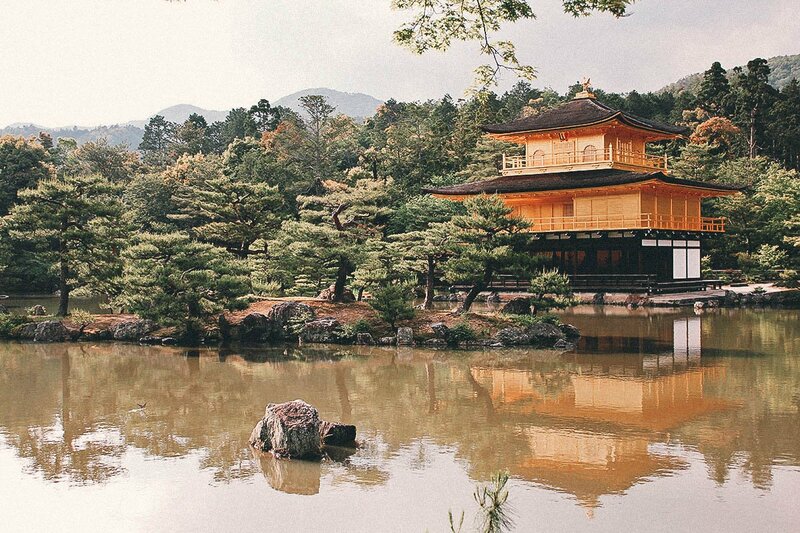 A stunningly beautiful temple covered in gold leaf, Kinkaku-ji is a World Cultural Heritage Site and one of seventeen locations that comprise the Historic Monuments of Ancient Kyoto. 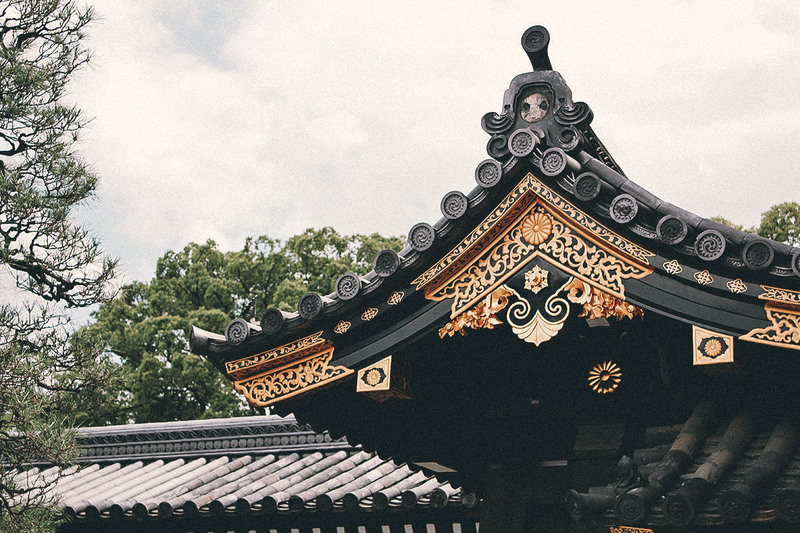 Its name derived from the gold leaf that envelopes it, Kinkaku-ji was once burned down by a schizophrenic monk who felt that it was “too beautiful”. Check out my post on Kinkakuji (Golven Pavilion) in Kyoto for more pictures and information. 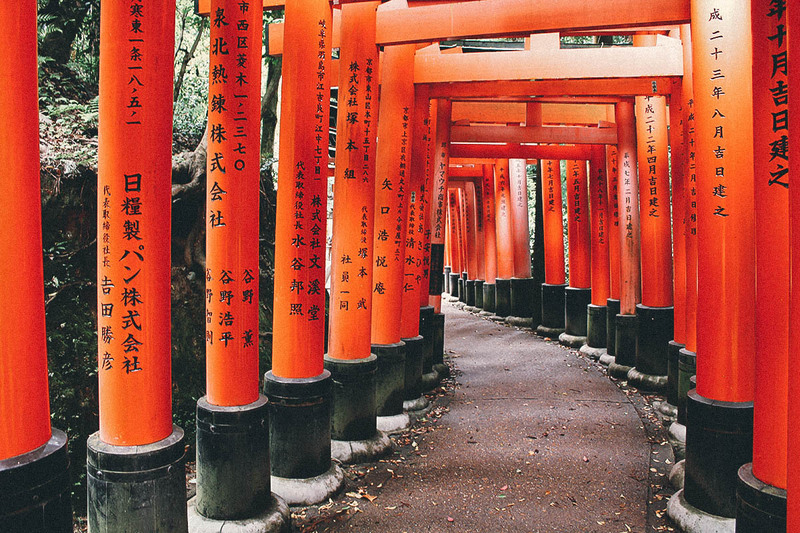 One of Kyoto’s most recognizable landmarks, Fushimi Inari Shrine is a Shinto shrine known for some 10,000 orange torii gates arching over a scenic, two-hour-long walking trail. Be sure to stop and enjoy a bowl of Kitsune Udon and Inari Sushi during your walk, both of which are specialties here. Check out my post on Fushimi Inari Shrine in Kyoto for more pictures and information. My favorite spot among all the places that we visited in Kyoto. It’s a magical place, like that iconic scene from Crouching Tiger, Hidden Dragon. Apart from these bamboo groves, the entire Arashiyama area is dotted with picturesque temples, gardens, restaurants, and shops. Located on the outskirts of town, be sure to allocate at least half a day here. 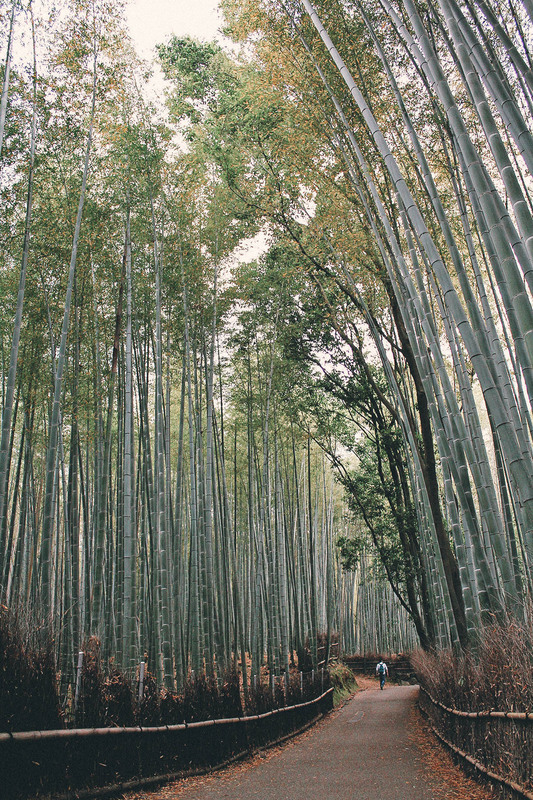 Check out my post on Arashiyama Bamboo Groves in Kyoto for more pictures and information. 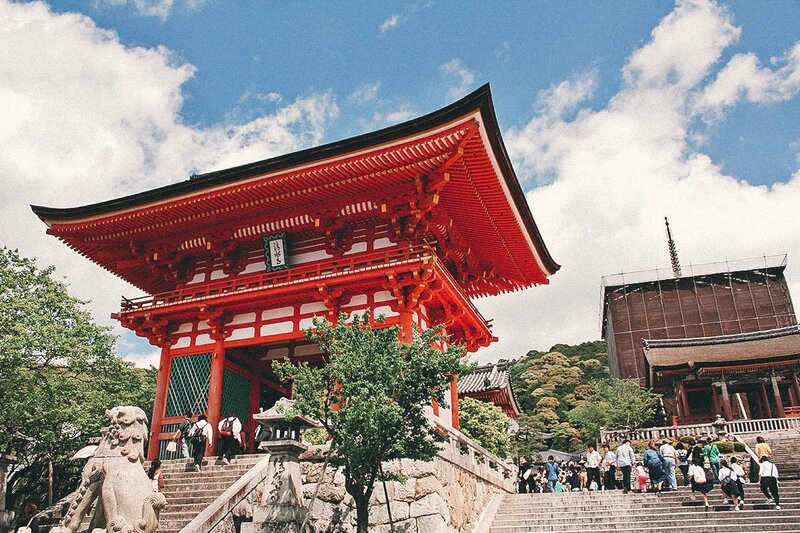 A temple for making wishes, Kiyomizu-dera is one of Kyoto’s most popular attractions and a UNESCO World Heritage Site. Unattached travelers should try and make their way blindfolded between two stones at Jishu Shrine, a shrine dedicated to the deity of love and matchmaking. According to legend, successfully doing so brings with it the promise of finding true love. Check out my post on Kiyomizu-dera in Kyoto for more pictures and information. 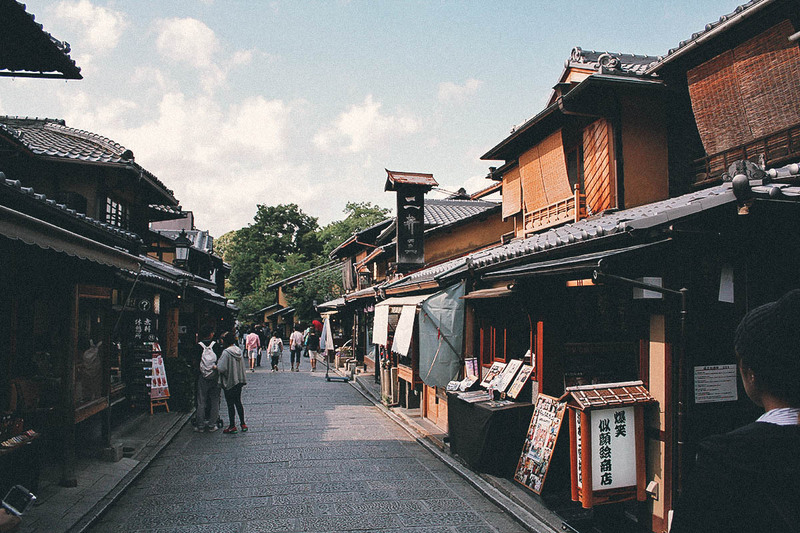 A charming shopping district that leads to and from Kiyomizu-dera, there’s no better place to soak up the Kyoto atmosphere than Ninen-zaka and Sannen-zaka streets. On both sides of these gently sloping roads are traditional wooden shops and teahouses offering many items from incense to fans to matcha cakes. Just be careful not to fall down here. Check out my post on Ninen-zaka and Sannen-zaka in Kyoto for more pictures and information. A UNESCO World Heritage Site, Nijō Castle is home to the Nightingale Floors, an ingenious alarm system designed to ward off ninja attacks. Just try walking on them without alerting the nightingales. Check out my post on Nijo Castle in Kyoto for more pictures and information. Nicknamed “Kyoto’s Kitchen”, Nishiki Market is a long and narrow shopping street with over a hundred food shops and restaurants on either side. 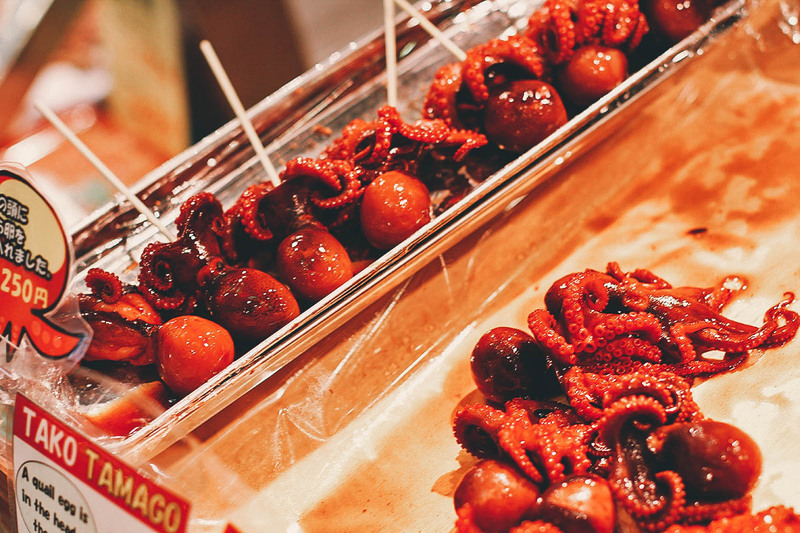 It’s similar to Kuromon Ichiba Market in Osaka, which appropriately, is nicknamed “Osaka’s Kitchen”. 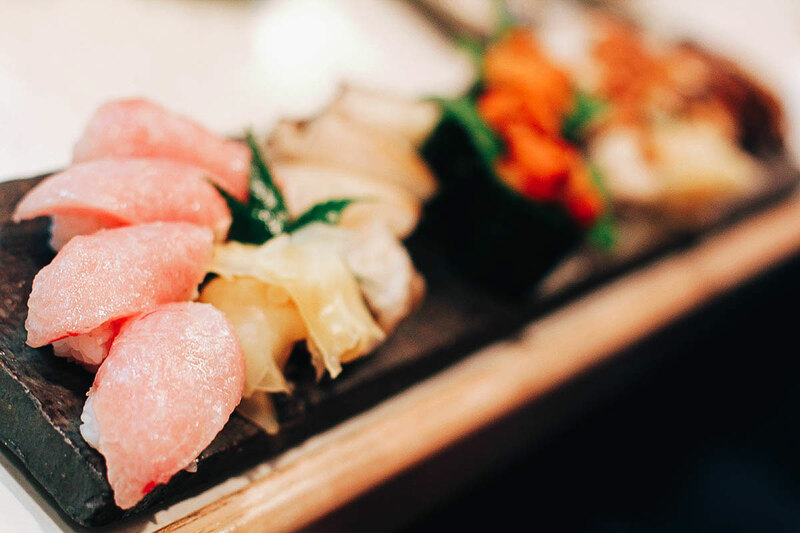 If you love Japanese food like we do, then you need to make a stop here. It’s about a 5 minute walk from Shijo subway station. 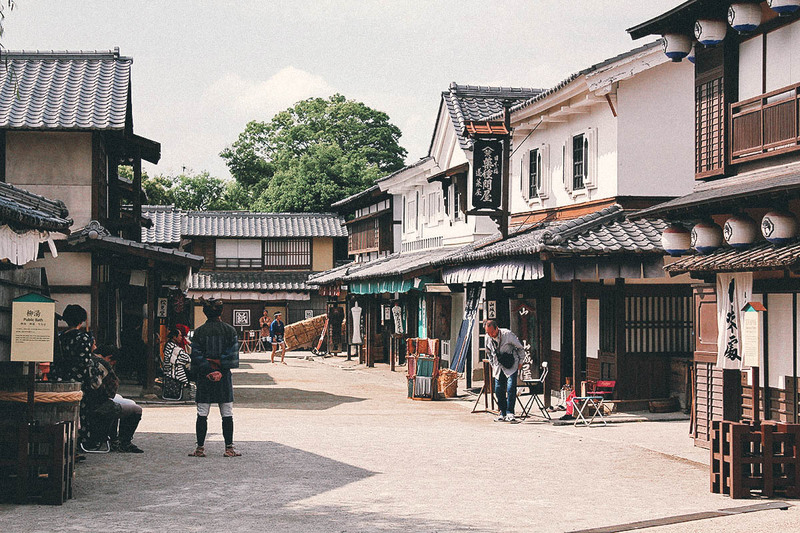 Step back in time at this active movie and TV studio where a reported 200 jidaigeki films (period films) are shot every year. Apart from the ninjas and samurais walking about, highlights include the Ninja Mystery House, Optical Illusion Maze, and Haunted House. Fans of the genre will be pleased to find an anime museum here as well. Check out my post on Toei Kyoto Studio Park for more pictures and information. 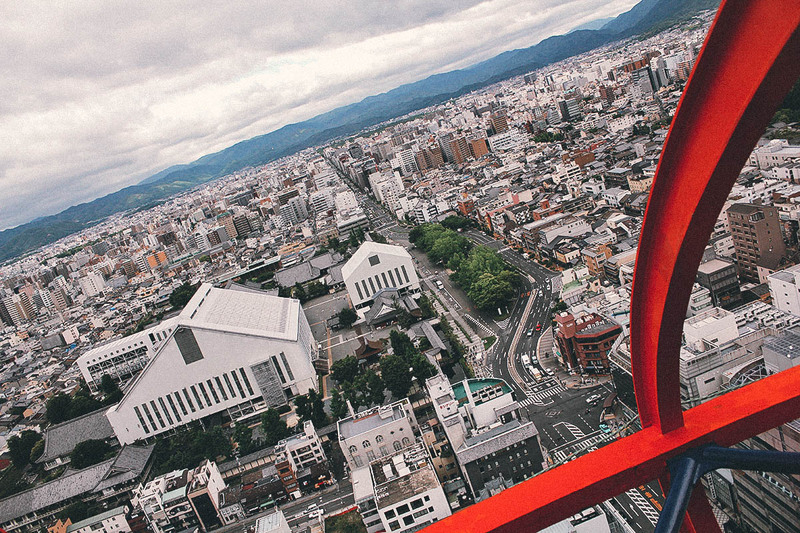 Conveniently located across the street from Kyoto station, you can get a bird’s eye view of the entire Kyoto area from here. It doesn’t take you as high up as other observatories in the world but the view is pretty sweet nonetheless. I adore Japanese food. It’s my absolute favorite cuisine in the world and a big reason why we love visiting this country. 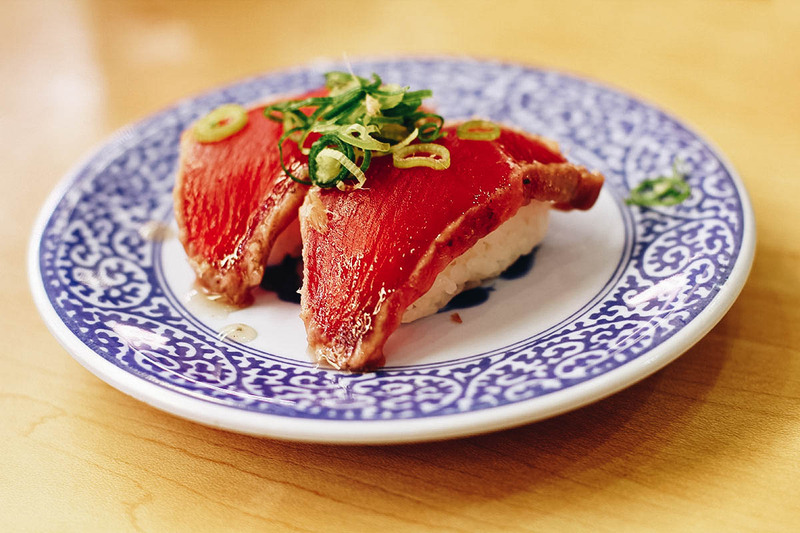 If you enjoy Japanese food as much as we do, then you need to read our Japanese Food Guide. It includes popular dishes in Japan as well as regional specialties by prefecture, including Kyoto. Nestled in the heart of the Gion entertainment district, Gion Kappa restaurant is a local favorite. It was highly recommended for two reasons: 1) they serve good, authentic Japanese food; and 2) almost everything on the menu goes for just JPY 390. Though cheap, the servings are small so you’ll wind up ordering several plates. Check out my post on Gion Kappa Restaurant in Kyoto for more pictures and information. One of the most popular kaiten-zushi (conveyor belt sushi) chains in Japan, a meal at Kura Sushi isn’t just cheap and delicious, it’s super fun too. Every single plate of sushi on that conveyor belt – from maguro, to hamachi, to unagi, to chuotoro, to hotate, to katsuo – goes for an even JPY 100. At the time, that was equivalent to about one dollar. I LOVED this place. Check out my post on Kura Sushi in Japan for more pictures and information. Though more commonly associated with Osaka, you can have great okonomiyaki in Kyoto as well, right here at Donguri. 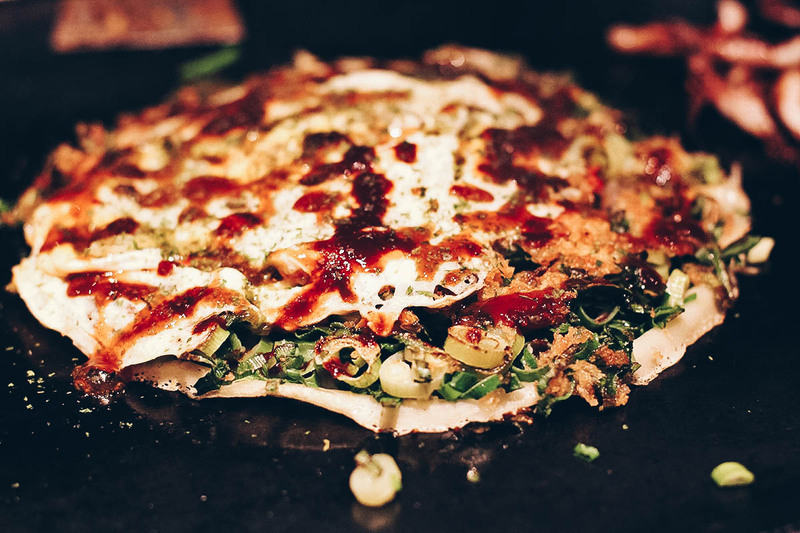 If you’ve never had this Kansai delicacy before, it’s a savory pancake made with a base of wheat flour, eggs, and cabbage, with a slew of other ingredients thrown in like seafood, beef, pork, and cheese. Really hearty and delicious. Check out my post on Donguri in Kyoto for more pictures and information.